Two geoscientists at Arizona State University have made a discovery among hot springs in Chile that may spur scientists to revisit a location on Mars explored several years ago by NASA's Spirit rover. The discovery involves fingerlike structures that form in the hot spring deposits by processes that combine biological and non-biological activity. The Chilean hot springs are at a place called El Tatio and lie at the edge of the extremely dry Atacama Desert, one of the best "Mars analog" sites on Earth. 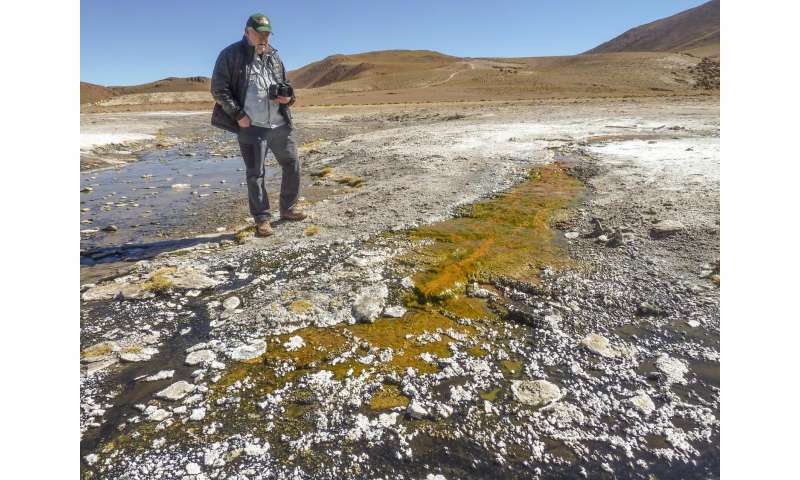 Co-authors Steve Ruff and Jack Farmer, of ASU's School of Earth and Space Exploration, report that El Tatio produces silica deposits with structures influenced by living organisms that appear nearly identical to those found eight years ago by Spirit in Gusev Crater on Mars. Their report was recently published by Nature Communications. The question naturally arises whether what Spirit found on Mars might also have been influenced by life. "Mars exploration has reached a stage where we can start looking for 'biosignatures'," said lead author Ruff. Biosignatures are naturally occurring traces that indicate the presence of life, either today or in the past. On Earth fossils are an everyday example of a biosignature of past life. But biosignatures can take more subtle forms such as organic molecules trapped in rocks. 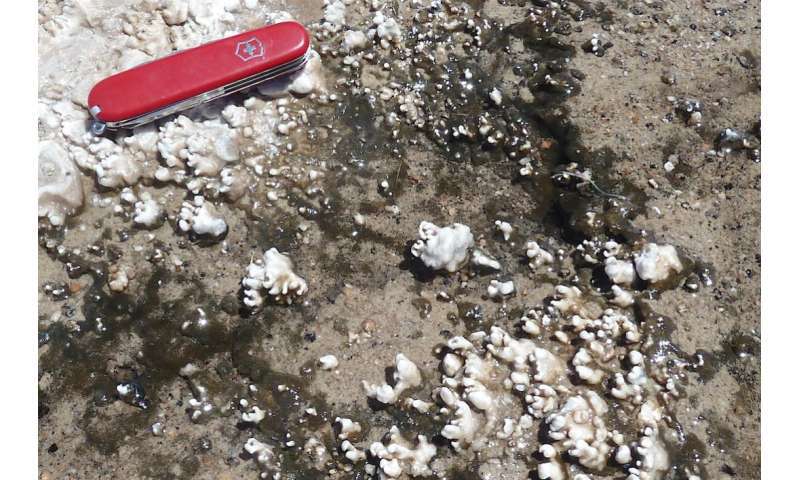 Biosignatures can also include physical structures such as compacted mats of microorganisms called stromatolites, found in various environments on Earth. No lander or rover on Mars has yet detected any fossils. So scientists assume that any Martian biosignature would be small—think microscopic—and difficult to identify, let alone even find, on a planet with as much surface area as all of Earth's land areas. 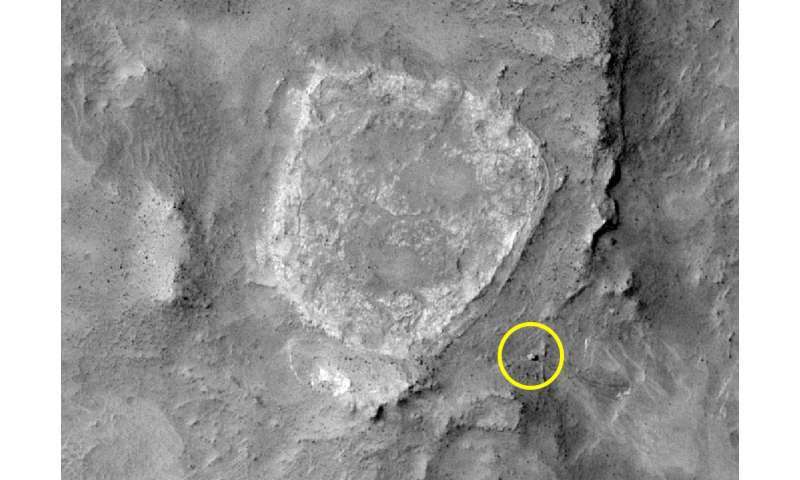 In 2007, NASA's rover Spirit was exploring next to an eroded deposit of volcanic ash dubbed Home Plate in the Columbia Hills of Gusev Crater on Mars. 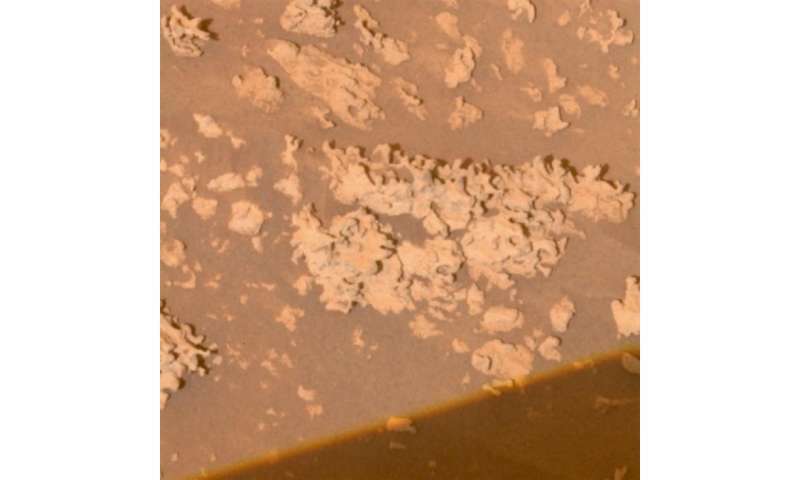 The rover's right front-wheel motor had failed, and as the rover dragged the stuck wheel like a plow across the ground, it uncovered a rich deposit of pure silica surrounded by outcrops rich in silica. This is a mineral commonly found in hot springs and geysers like those that Yellowstone National Park is famous for. Ruff was one of the scientists who identified the silica mineral and along with Farmer, published observations supporting a hot spring origin. But the unusual nodular and fingerlike structures of the silica outcrops next to Home Plate were poorly understood. Several years later, Ruff learned about the El Tatio hot springs from a scientific journal. The hot springs are among the highest known active thermal springs on Earth (over 14,000 feet). At night, even in summer, temperatures at El Tatio often drop below freezing, and by day lots of ultraviolet light from the sun comes through the thin, dry air. This makes El Tatio probably the best terrestrial analog for ancient Martian hot springs. "We went to El Tatio looking for comparisons with the features found by Spirit at Home Plate," said Ruff. "Our results show that the conditions at El Tatio produce silica deposits with characteristics that are among the most Mars-like of any silica deposits on Earth." These characteristics compare favorably with the Martian Home Plate silica outcrops, Ruff explained. "The fact that microbes play a role in producing the distinctive silica structures at El Tatio raises the possibility that the Martian silica structures formed in a comparable manner—in other words with the help of organisms that were alive at the time." NASA has plans to send a new rover to Mars in 2020. The yet-unnamed rover will be similar in size and power to the Curiosity rover, currently exploring Gale Crater. But the new rover will have more advanced instruments and the ability to collect and cache samples for later retrieval. So where should the 2020 rover go? As NASA did with Curiosity, it has held a series of workshops over several years, where Mars scientists present their best case for one landing site or another. At the end of each workshop, candidate sites are ranked according to their fitness in regard to certain qualities. These include geological setting, potential for preserving biosignatures, and quality of returned samples. Currently the Columbia Hills/Home Plate site in Gusev Crater stands No. 2 on the list of eight candidates. It's second only to an ancient lakebed in Jezero Crater on the northwest edge of Isidis Planitia, an old impact basin. The next site selection workshop is scheduled for February 2017, with plans to cut the list down to a "Final Four." Although returning to Gusev's Columbia Hills and Home Plate would rule out exploring a completely new area of Mars—which many scientists would like to do—Ruff and Farmer are hopeful that the site's chances are quite good. "This is a known hydrothermal deposit," said Ruff. "We know exactly where to land and where to go collect samples. And the silica structures found by Spirit meet the definition of a potential biosignature."